I’m away this weekend for a workshop with Sally Payne down at Hospitalfield near Arbroath so not far for me to travel and the site of many previous positive experiences; but more of that in a future post. Today I would like to share with you another Studio Conversation, this time with former colleague, artist Jackie Cartwright. Jackie and I met when we were both tutors at Dundee College and I contacted her about a Studio Conversation after seeing her recent exhibition here in Dundee. After a spell working in the illustration department of Dundee’s Courier, Jackie studied at Duncan of Jordanstone College of Art & Design and as well as working as a professional artist she taught, like me, at Dundee FE College. She is passionate about wildlife but also loves portraiture so her paintings are beautiful sensitive representations of her subjects. I started by asking her about her time at art college. Jackie, we are both graduates of DoJCAD. What are your memories of your time there and how has it influenced your practice. I went to DoJCAD as a mature student. I’m not going to lie, I nearly burnt myself out there! However, good memories are the ones that stick! My year was fortunate to have Bill Cadenhead as a 1st year tutor. He taught us the fundamentals of oil painting. His advice using oils has been an invaluable source to me. We were also lucky to have Tony Morrow and Alastair Ross for sculpture. I enjoyed sculpture so much that I went along to Tony’s portrait sculpture classes every Saturday morning as well…no wonder I nearly burnt myself out! Sculpture requires you to look at your subject with more intensity, scrutinising every small detail which, I’m sure, helped enhance my drawing skills. Bill Cadenhead and Alastair Ross were two of my first year tutors at art college. I remember it was Bill Cadenhead who was the tutor for our first life drawing class with a model. I think he enjoyed the varied reactions to the situation! However you and I met when we were both art tutors at Dundee FE College. Has teaching been an important part of your practice? Absolutely, teaching is very rewarding and I got just as much back from my students as I gave to them, if not more. One main challenge I found difficult was to learn to talk and draw at the same time whilst doing demonstrations…this fought against my concentration. I also had to quicken up my drawing A LOT! The project briefs I wrote for students still help me out today. If I have a lack of inspiration/ mental block I just think of a project to give myself. I think people are fascinated by an artist’s studio, I certainly am, and of course each one is quite individual so can you describe your working space? Do you like to work with music or radio playing or do you prefer to work in silence? I am so lucky to have a custom made studio built in the garden. My husband was fed up with my art stuff spreading out of the spare room …so he had a studio built as a 50th birthday present! I call it my midlife crisis, men get sport cars, I got an art studio! And guess what, that spare room is still filled to the brim with art stuff! When working I do prefer some background noise whether it be music or a dvd playing on tv…it makes me feel less isolated somehow. You produce beautiful work of wildlife in pastel but you work in a wide range of media. Do you have a preference or is it the subject of individual paintings that determines the medium? It usually is the subject and the size that determines the medium I use. If I want to do the subject small scale I tend to lean towards watercolour, acrylic or oils as they lend themselves to the finer intricate details. If larger in scale then pastel is my preference. I try to envisage how the subject would pan out in both scale and medium before making a choice. What is it about working with pastels that appeals and do you have a favourite surface you like to work on? Pastels are so versatile, enabling you to create different textures through layering and pressure of your strokes. I use a mixture of pastels as each brand holds different qualities. Rembrandt pastels are firm where as the Unison and Sennelier ones are soft. Due to the fine detailing in my work I prefer a smooth paper. Therefore, most pastel papers do not suit me. I like pastel card as it gives a velvety texture to your painting but because it is like fine sandpaper it eats up your pastels very quickly. 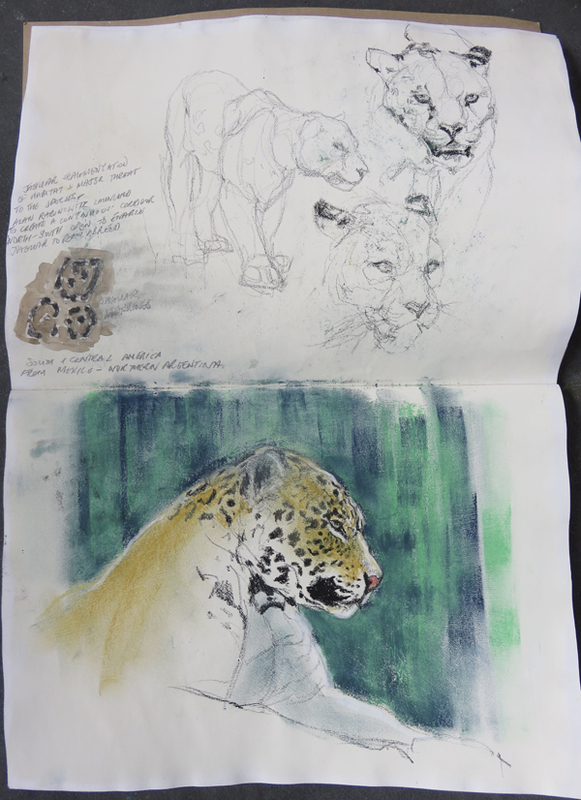 My favourite paper is Fabriano Tiziano, a cotton mix paper…very smooth but has enough tooth to hold the pastels. For larger work I use smooth watercolour (HP) paper. 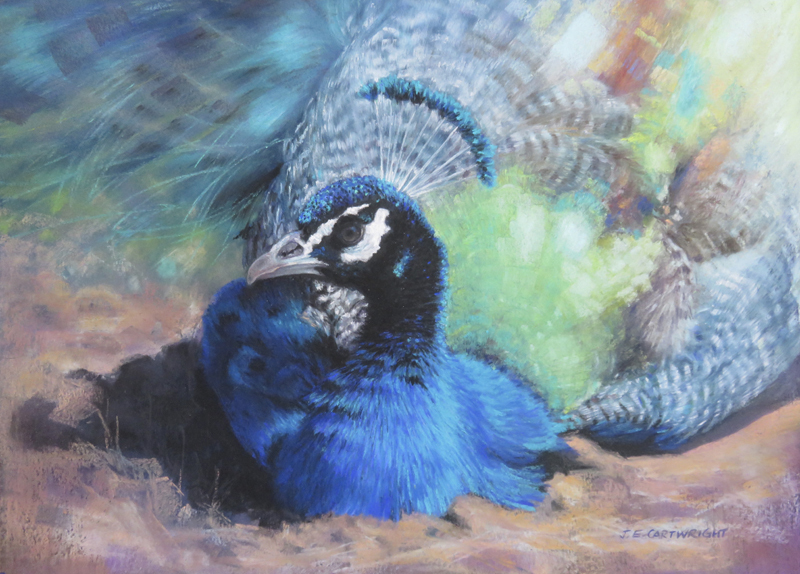 You are well known for your wildlife paintings, but you also produce portraits and life drawings. Is it fair to ask if you have a preference or does it depend on future plans or commissions? Oh! Good question! I never really thought about it as I love drawing both…anything to do with life! My interest in wildlife started from a very young age…back then I would draw from photographs in wildlife books and magazines. I wasn’t really hooked on life drawing until I went to Jean Martin’s life drawing classes, at Dundee College, in 1996. (Incidentally, Jean is the person who introduced me to good quality pastels…one of my favourite former tutors…now a very good friend and an invaluable mentor to me!) I have been attending life drawing classes ever since! 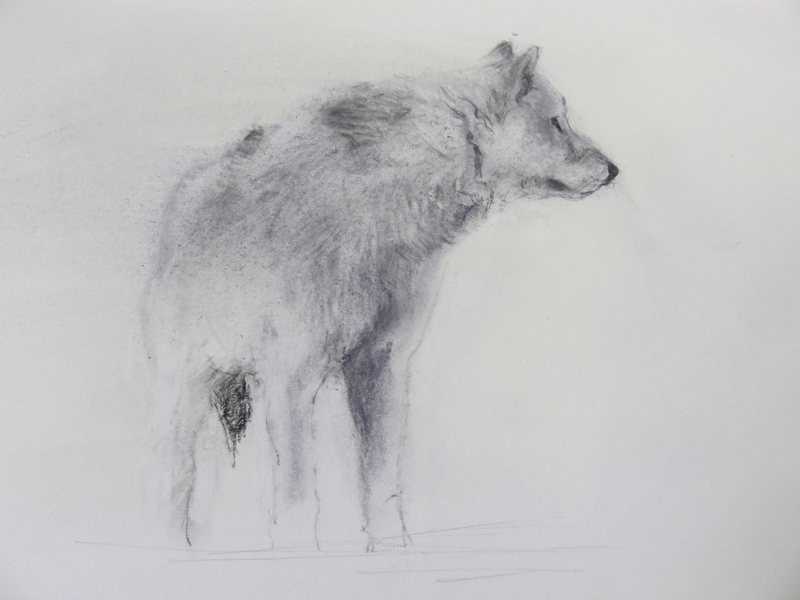 In my practice I feel drawing wildlife and life drawing compliment one another…for me both are about capturing the essence of movement. I use life drawing to keep my senses sharp, so to speak! Afraid I tend to shy away from commissions now. Do you have a daily or regular drawing routine and what are your preferred techniques for visual note-taking? It is very difficult to keep to a disciplined routine when working on your own. I have fallen out of the habit of drawing in my sketchbook everyday and really should get back in to it again! I work best when I have something to work towards…probably the illustrator coming out in me – used to deadlines! I occasionally go to Camperdown Zoo on my own to sketch the wildlife. I always have my camera at hand too. The best time for action photos is when the animals are waiting to be fed. And the best time for sketching is when they are sleeping, eating or have just been fed. When on holiday, I carry a small paperback sketchbook to take notes and quick scribbled sketches…with an impatient husband at your back, there is never enough time to do proper sketches! You recently had an exhibition in one of our local galleries, what plans do you have for the coming months? It was a wonderful opportunity to show a body of work in my home town. I’m now working on more wildlife pieces for a September exhibition to be held in an Edinburgh gallery. I’m not very good at the self promotion side of things but have been very fortunate with gallery invites….otherwise my work would still be stored away in my plan chest drawers. Thank you for your time Jackie and what a rare privilege to see these pages of your sketchbooks. I am also interested to hear about the surfaces you work on and the different qualities of the various brands of pastels. If you would like to see more of Jackie’s work you can find her blog here and she is on Facebook and Instagram. Her exhibition later this year is to be in the The Union Gallery Edinburgh, definitely one for the diary if you are in the area. A super read about your working process and inspirations Jackie. 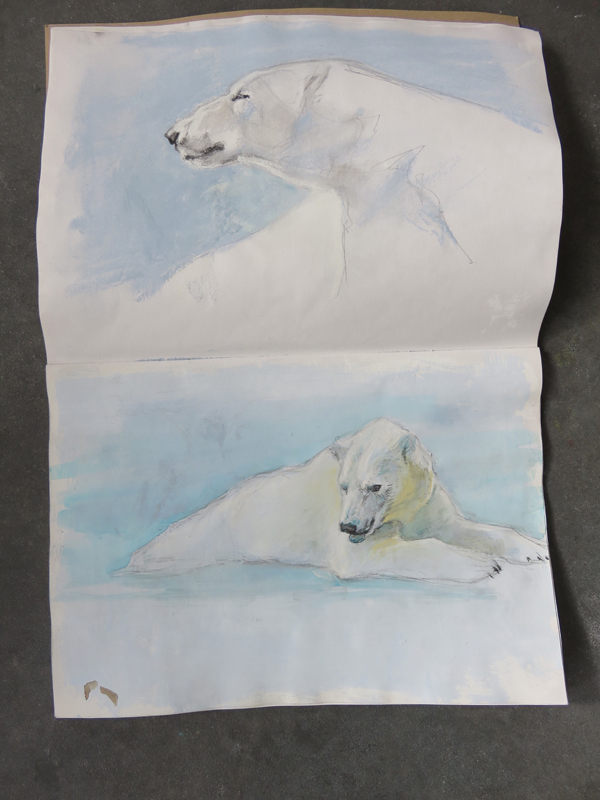 Great to see the beautiful sketchbook drawings as well as finished pieces. All the best with your show. Thank you Sheila, another inspiring conversation! Jackie puts her heart and soul into every piece of artwork she does,to me you can see it in the eyes of the animal/bird ,their eyes are alive like they are showing you emotion. A fantastic artist and a lovely lovely lady.